Irony of ironies. As Israel continues to build its 25-foot-high “security wall” against the Palestinians, one has to wonder, “Hmm. This looks familiar.” Remember the Warsaw Ghetto in the 40s? Then, the Nazis basically tried to bury Polish Jews alive, sealing them off and sealing them in, like something out of Edgar Allen Poe. It was a nightmare experience for 440,000 Jews, who were faced with starvation and rampant disease. Smuggling became a necessity: smuggling goods out to be sold, and smuggling supplies in, often using children. With no access to outside employment or health care, the Warsaw Jews tried to create a little economy of their own and opened clinics and soup kitchens. Anything to survive. By 1943 the Nazis had been transporting Warsaw Jews to camps like Treblinka. Out of options, the Jews started an uprising, courageously holding off the Germans for four months– against overwhelming odds. Yet, despite their valiant efforts, over 100,000 Jews had either starved to death or died of disease, and tragically, those who survived the uprising were sent to the death camps. A gruesome and heroic chapter in Jewish history. Such savage cruelty on the part of the occupying German forces; such fierce heroism and humanity displayed by the Jews. One can scarcely read the accounts without weeping for the Jews and for humanity as a whole. Today, looking at the security wall that supposedly separates Israeli settlers from Palestinian terrorists, one needs to gulp and ask, “Is history repeating itself?” Although the American public believes the purpose of the wall is for security only, darker motives are also at work. The wall does not follow the border between Israel and Palestine (the land given by U.N. mandate to the Palestinians, much of which is being rapidly settled by Israelis). The wall cuts a wide swath through Palestinian land, through towns and even churches, cutting families off from one another, cutting the faithful off from places where they have worshiped for thousands of years. The wall is meant to protect Israeli settlers occupying Palestinian land. It also separates a prosperous Israel from the increasingly impoverished Palestinians, who, because of the wall and no access to new roads, have little hope of finding employment. Health care, too, in the Occupied Territories is of great humanitarian concern, as the level of health and nutrition continues to drop. Smuggling is for many communities the only way of survival. Although most Israelis want peace, two decades of conservative party rule has made a mockery of past peace initiatives. Their leaders may say they want peace, but their actions clearly demonstrate that they feel a manifest destiny to possess all Palestinian lands, paying lip service to the peace process, but all the while slowly encircling the indigenous people like a noose, leaving them to starve or die of disease– until, perhaps, all that is left of them will be tiny reservations for tourists to visit and say, “Ugh. Me smoke-um peace pipe.” Does this all sound familiar to us in the U.S.? It should. We are a very good teacher. And we’re helping to make it all possible, since Israel receives one quarter of all U.S. foreign aid. “But, Steve,” you say, “the Palestinians must recognize Israel’s right to exist.” Yes, but which Israel must they recognize? The pre-1967 Israel that agrees with U.N. mandates, or the Israel that has settled and now claims Palestinian land and threatens to swallow them up? “But the Palestinians must renounce terrorism?” Why? So they can be ultimately wiped off the map and out of the history books? I hate terrorism as much as you, but when people have no hope, history shows us, they do desperate things. When it comes to peace, both parties are their own worst enemies. For there to be enduring peace, Israel must vacate Palestinian land, and the Palestinians must teach their people to renounce terror. But since Israel has no inclination to vacate, there is little hope of convincing Palestinian youths that blowing themselves up is not martyrdom. If you want a fair assessment of the situation (stuff you won’t get on the 6-o’clock news here in the States) by a shrewd politician whose been there on the ground working for peace for the past 30 years, read Jimmy Carter’s book, Palestine: Peace Not Apartheid. Also a good overview of the Middle East is Melissa Rossi’s What Every American Should Know About the Middle East. Rossi is a correspondent who’s worked for decades in the region. http://www.amazon.com/Every-American-Should-About-Middle/dp/0452289599/ref=sr_1_3?ie=UTF8&qid=1235675384&sr=1-3 Because they are not elected officials or media giants, neither of these authors fears AIPAC (America’s powerful pro-Israel lobby that controls how we view the conflict). Congratulations for taking a courageous stand. I only wish there was more that we could do. As always, Steve, you have succinctly and accurately summed up the situation. Clearly you have a passion for this situation, since you have blogged about it before. While I have not read Carter’s book, I have seen several interviews that he has done. It starts with both sides admitting they have been wrong. Unfortunately, Israel isn’t interested in admitting any wrong-doing. The last national election I’m afraid will only exacerbate the situation further. Between the Pakistan / Afghanistan problem and the Iraq / Iran debacle, this seems like small potatoes. But, imagine if 40 years ago Israel had taken a different approach than the one they took. I wonder what kind of world we’d be living in today? Would we have had the rise in Islamic extremism that we take for granted today? I doubt it.I too hate terrorism, but you point is well taken. Desperate people do desperate things. It is beyond stupid to compare Israel’s wall, erected after the calculated cold blooded murder of 875 of its innocent citizens, to the wall in Berlin which was erected to keep East Berliners from escaping to freedom. This border, has alreadyprevented the death of 200-300 Israeli citizens interrorist attacks for the past year or so, comparedto statistics of an earlier year. It also saved the livesof some innocent Palestinians who could have suffereddue to higher Israeli anti-terrorist activities. 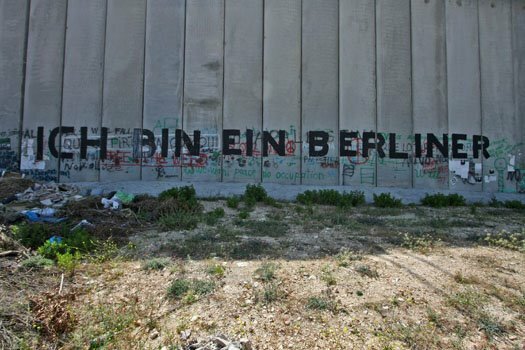 PS- Actually, I did not compare the Israeli wall to the Berlin Wall in the blog itself, but obviously some Palestinian graffitist did, hence the photo. My comparison was to the Warsaw Ghetto, which is far worse. The wall is more than a security barrier. It also represents Israel’s unwillingness to come to terms with its own responsibility in helping to breed terrorism. There would be no terrorism, no Hamas or Hesbollah if Israel were not oppressing this people. And I resent that Americans have to die in wars that are the direct consequence of our stupid policies. Walling an entire nation out, so that it is out of sight and out of mind is akin to stopping one’s ears against the word of God. What would the OT prophets say?